To a lot of people, a front porch is kind of like having a living room when you already have a family room. You know what I mean – a space that you want to be pretty, but not one that you really use. That isn’t the case for us. Pookie and I really do spend quite a bit of time on our front porch once the summer temps cool down and the mosquitoes leave town. Our front porch is long and deep. I haven’t completely finished with the overall decorating of it yet. I’m undecided about whether or not I should add an area rug and another table to each side. I normally keep two wicker rockers at each end of the porch, but that looks a little sparse since I haven’t finished with the overall decorating. So I’ve pulled two of the chairs closer to the door to create some fall coziness. Even though each side is slightly different, the overall look is symmetrical, which I think looks best on our porch. I hope y’all know by now that I always, always want to inspire and encourage you! Every single thing that I post is meant to help you affordably create a home that you and your family love. So with that being said, let me break a couple of things on the porch down a little. Let’s start with the urns. The recipe for creating the look for each of the urns is: urn + birdcage or wire lantern of some sort + a tall candle + two twig wreaths (one of which is the spray kind) + four fall picks = one fall urn. 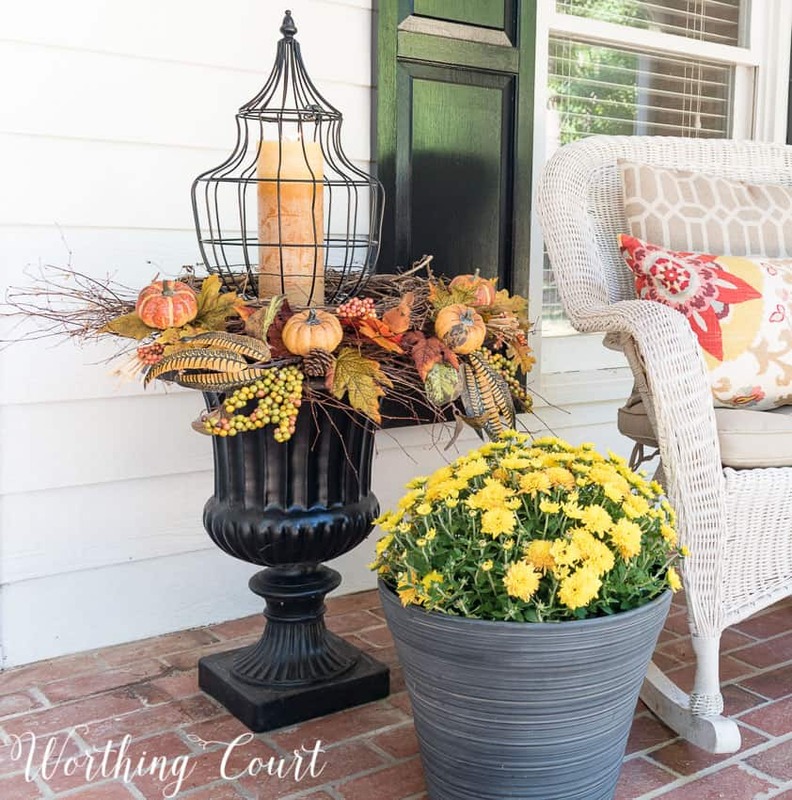 I used the exact same method for assembling these urns as I used on my fall front porch last year. The only difference is that I tucked a few fall picks in between the stacked wreaths. Click HERE to read the urn tutorial. The fall picks were stuck into the twig wreaths after the rest of the urn was assembled. And yes, I had to mess and mess and reposition the picks over and over until I got them looking the way that I wanted them to. I didn’t bother with placing picks around the backside of the wreaths, but you certainly could if you wanted to. See how a regular twig wreath is simply stacked on top of a spray twig wreath? To elevate the lanterns to the height that I want them, I placed an empty plant container in the bottom of the urn (turned upside down). The wreath on the front door is even easier! I started out with a large 24″ twig wreath. Our house sits back from the street a bit, so I like to make a statement with a large wreath. I literally just poked everything in between the twigs of the wreath. No wiring, no tying and no hot gluing! I used six long stems of faux bittersweet, that I cut into shorter pieces and tucked in all the way around the wreath. Once those were in place, I added two fall sunflower picks to the center of the bottom and then tucked another smaller berry spray behind each side of the sunflower picks. All of the picks have wire stems, so once they were positioned in the right spots, I just bent and fluffed everything to make it look the way that I wanted it to. My whole porch follows my KISS method of decorating. Don’t know what that is? You can read all about it HERE. 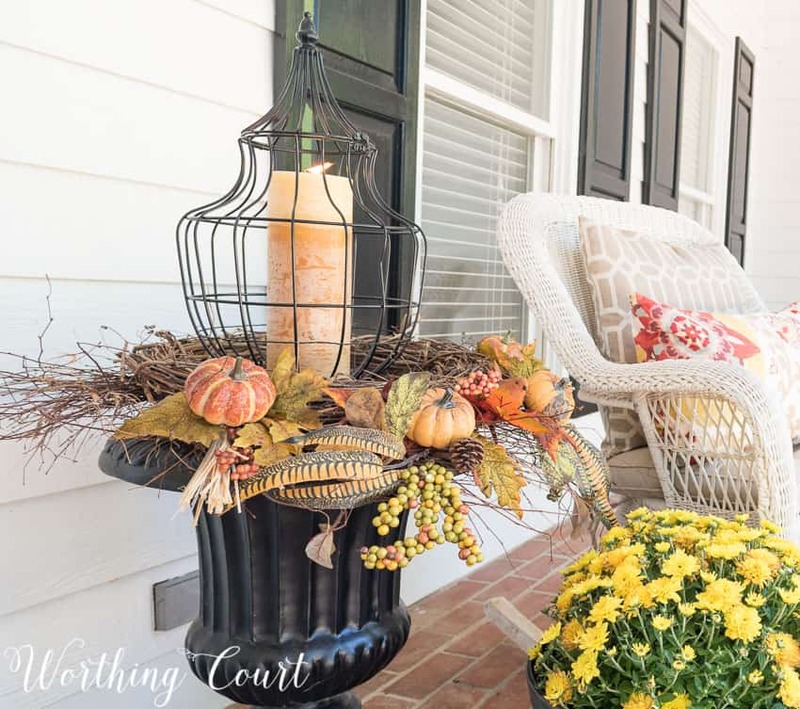 By using basic elements on my porch, I’m able to just tweak and add few things to the porch to get it ready for any season! 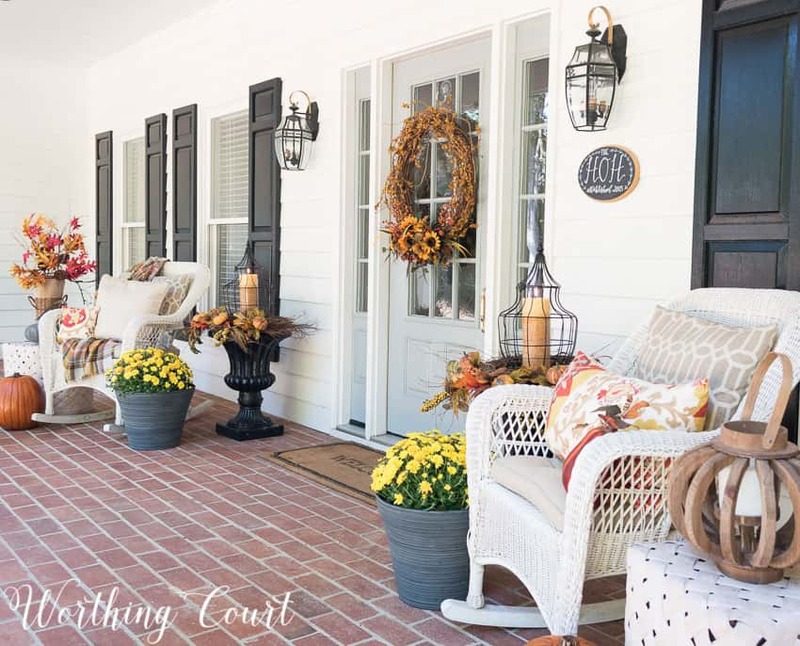 LOOKING FOR FALL PORCH DECORATING INSPIRATION? PIN IT FOR LATER! 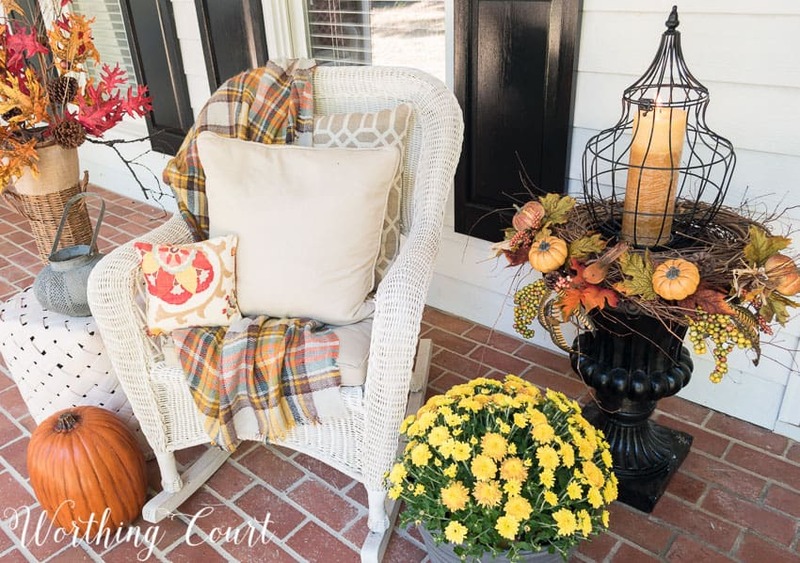 What a beautiful fall porch you put together, Suzy! Just makes me want to come over and sit awhile! You are a favorite blogger of mine. You never disappoint. I get so excited when I see your post in my email. You have given me so much inspiration, and I thank you for that! Can’t wait to see what’s next! Happy Fall! Lovely! And I love that your ideas are easy and affordable. I’m decorating our (small) front porch for fall this year for the first time. In the past I’ve just done a wreath on the door. You’ve definitely given me some inspiration. Thank you! I enjoy reading your blog and watching how you have been transforming your house into a beautiful home. It doesn’t look anything like when you bought it. So updated and welcoming. I cann’t imagine my family moving after living in the same house for 36 years. I would love to take everything out of my house and rethink where to put furniture and get rid of stuff that no longer has a purpose that is just taking up space. 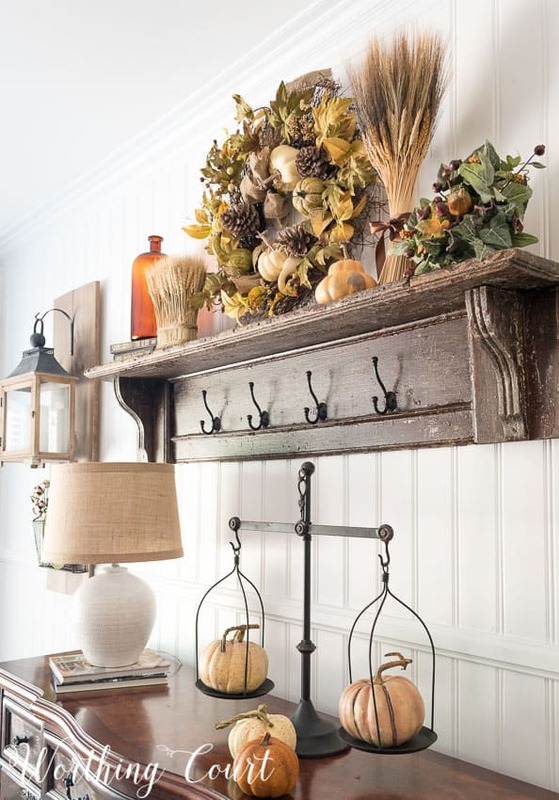 I have enjoyed it being a little cooler in NC the last two weeks I cann’t stand the heat and cleaning up on the outside ready to decorate for fall. Loving your porch! Those urns turned out great, am I totally developing a serious crush on those large cages! 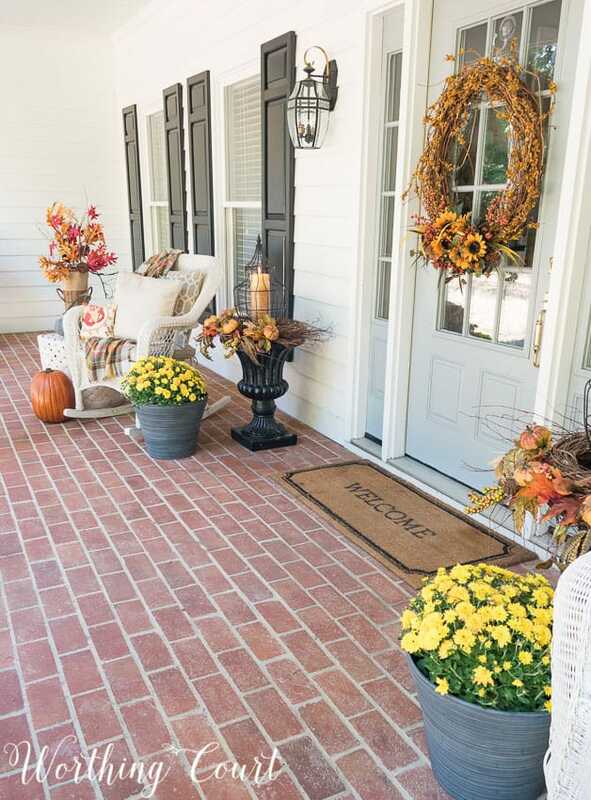 Your porch looks so inviting and ready for fall. I just love the mums and always use them on my porch. Also like the bittersweet wreath. I am on a hunt this weekend for pumpkins and mums. Your fall porch is very warm n welcoming….love the fact you r budget conscience as well……look forward to ur posts. Very, very pretty. 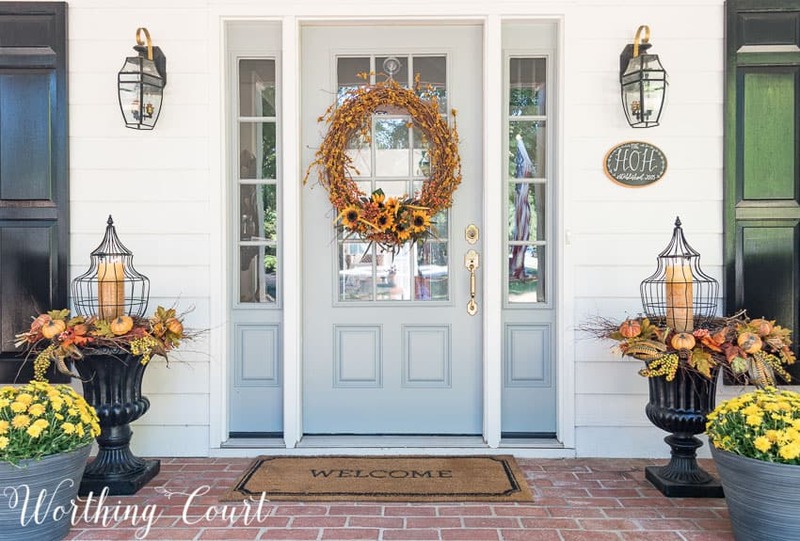 Perfect for the welcoming the season! 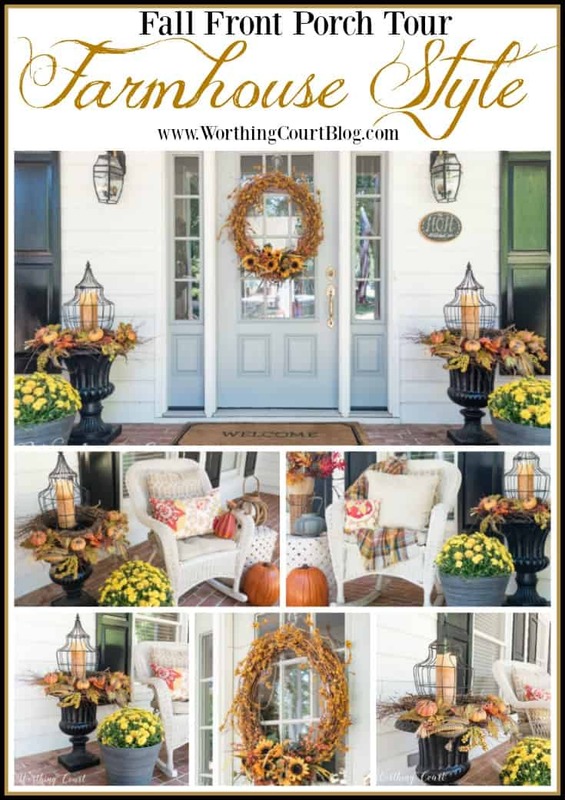 Gorgeous fall pictures, love the porch and the fall decorations, excellent choices. Everything looks awesome GF!! Loving your urns this year and the big wreath!! You’ve been BUSY!! Gorgeous touches. Love the way you have your urns displayed. My mums are already out in my black pots, but I hadn’t thought about adding the garden cages. I will tweak tomorrow. Thanks for the inspiration. Come on beautiful days of autumn. Love all your “country” and “vintage” ideas and I am using some to decorate my home. Love Halloween ideas. I love the cage things you have in the urns! Were they purchased this year? Can you tell me where? I’m in NC and would love to find some of them!! Hi Tina. I found mine on the clearance isle at At Home. I was just in the store yesterday and they still had some. They don’t offer online shopping, but here are links to a couple that I think would work just a well: http://fave.co/2d1yOhn , http://fave.co/2d1ypLD . Wow gorgeous! 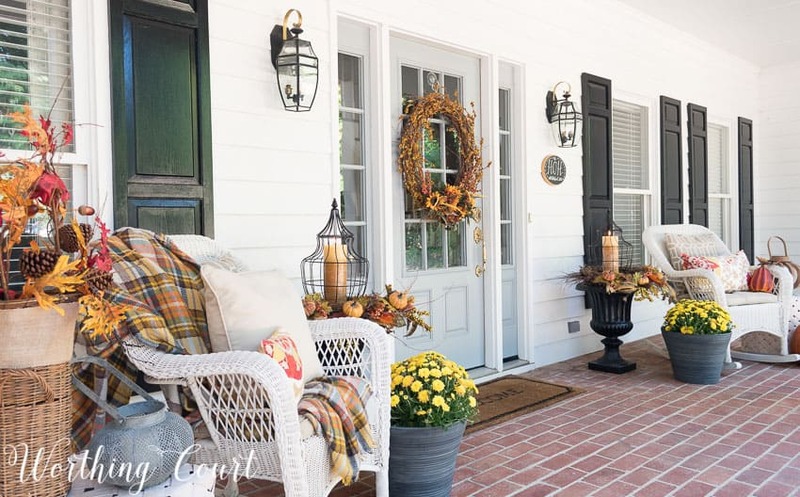 New to your blog and loving it especially this porch. Where did those cages come from really unique! Hi Candy. I found mine on the clearance isle at At Home. They don’t offer online shopping, but here are links to a couple that I think would work just a well: http://fave.co/2d1yOhn , http://fave.co/2d1ypLD . 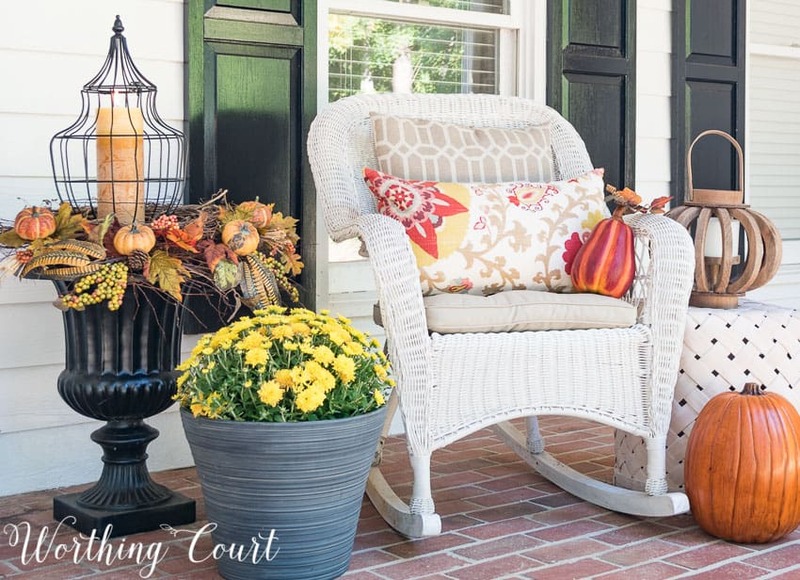 Your front porch looks fabulous, Suzy! You’ve created such an inviting look. Thanks for sharing at Snickerdoodle. I’ll be featuring this as our Snickerdoodle Special at today’s party. Hope to see you there! Your porch is stunning. Oh my goodness, everything about it is beautiful and wish I could have a big porch like this to decorate. It’s lovely! You have a lovely front porch! 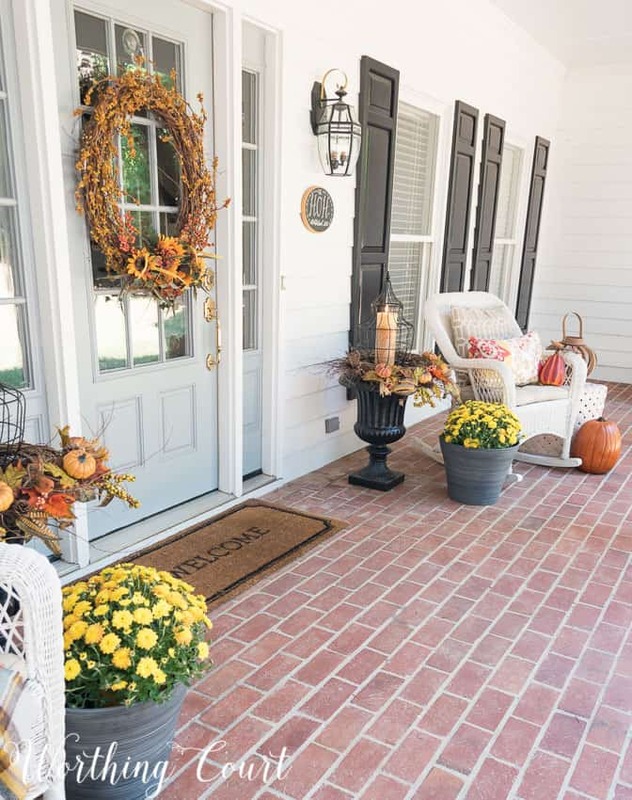 Thanks for sharing your porch at Craft Frenzy Friday on Mom Home Guide — it’s a party feature this week! 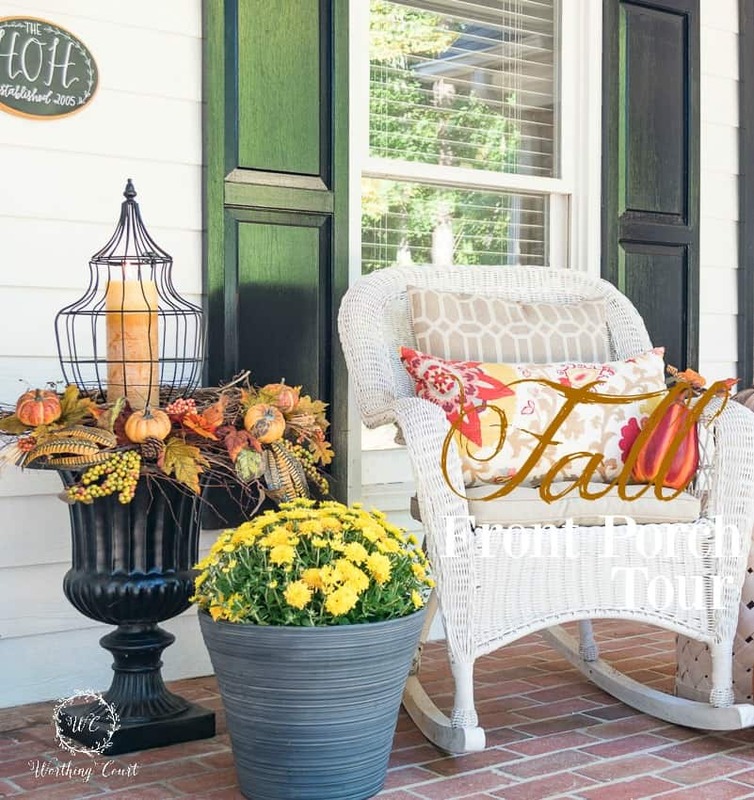 You have a beautiful porch, I love what you have done with adding all the fall touches. I have been trying to decide to add black shudders back to ours since we are renovating . Thanks , I have decided the black ones are a keeper. I love the idea of layering the wreaths on the urn. So simple, but packs a big punch! I love your urns. I have a little one at the base of my stairs that I think will look good with that sort of set up. My house is blue with taupe and red trim, so I think a red/orange candle will work along with the fall picks in the wreath. Now, to just figure out how to make that wire thingy over the top of the candle…. I love your ideas for front porches. I plan to change mine up a bit this year! Thanks. I love your Fall porch decorations! They are just perfect! I love the way you decorated the urns! Thank you for all of the great ideas you share with us on all your blogs! My favorite are the Urns on your front porch. I have the same urns but they are exposed to the harsh winters here in New England. 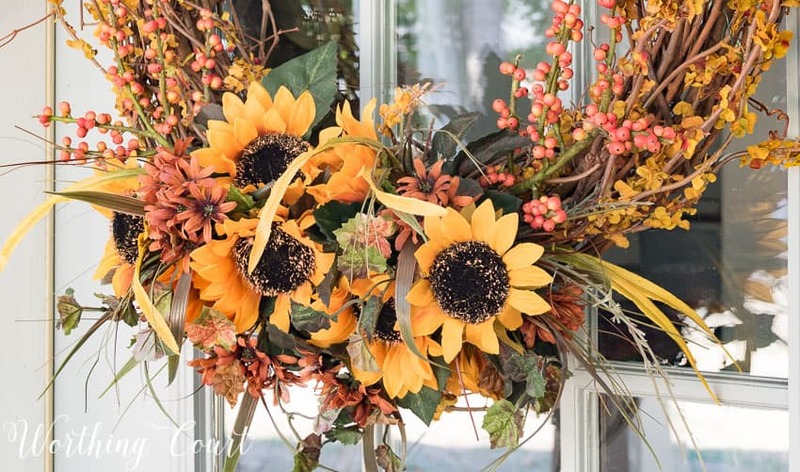 I love your fall porch! 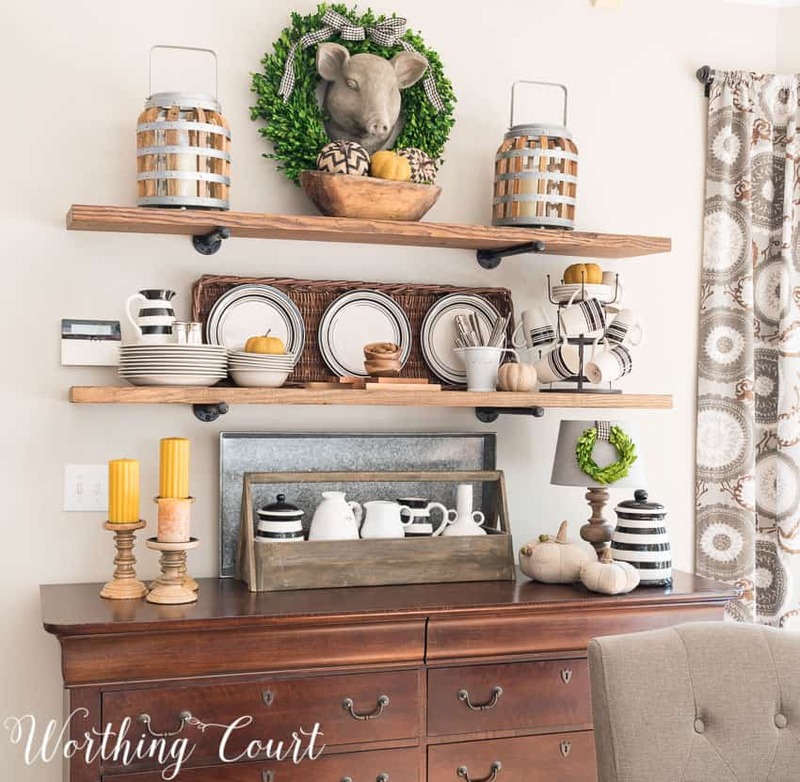 You have a lovely knack for decorating and seeing new uses for old things. 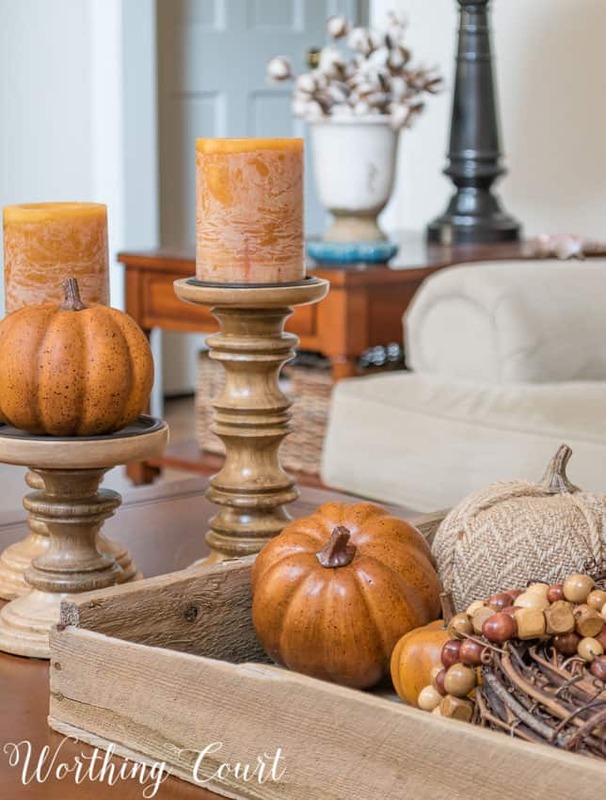 But my favorite thing you do is the way you layer things – wreaths, your mantel, your shelves, your fall urns! Thank you for inspiring us and sharing your wonderful ideas, and for giving easy to follow instructions! Can’t wait for the mums. 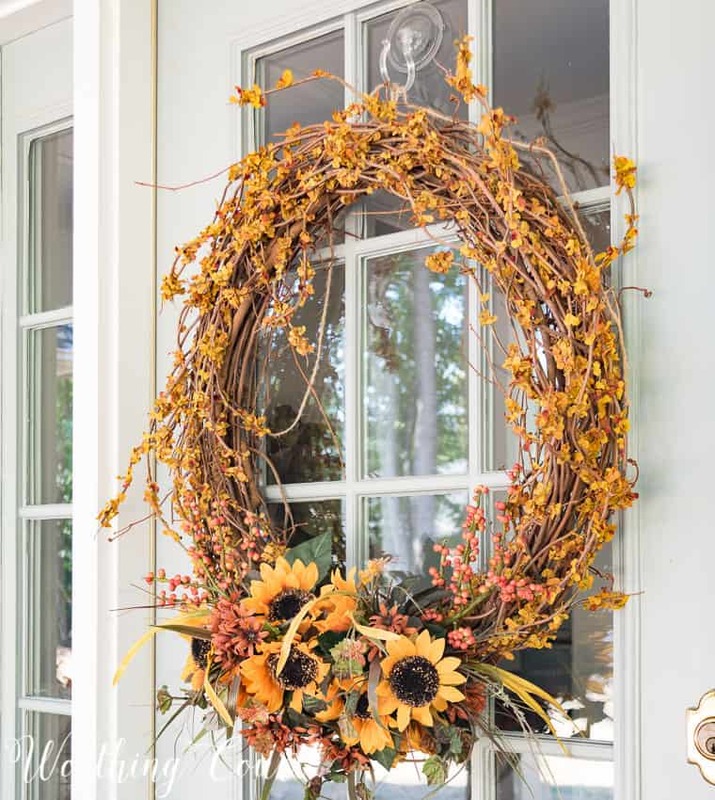 Love your fall wreath on your front door. What kind of stems did you use to go around the whole wreath and where did you get it? I love the look of it! OH I could rock and rock and rock. Everything is beautiful. I’d never get anything done for wanting to stay there on the porch! What brand is the front door and where did you get the outdoor lights beside the door? I’m looking for both. Beautiful! Thank you!